You just can’t visit downtown Gatlinburg without trying the fresh trout. It’d be like going to the beach and not having any seafood. 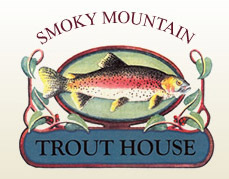 And if you’re going to have some trout, the Smoky Mountain Trout House in downtown Gatlinburg is the place to have it. All their trout is fresh from the pristine waters of the Smoky Mountains and prepared just the way you like it. They certainly prepare it myriad different ways – broiled, fried, sautéed, cheese-baked; you name it, they’ll make it. The Smoky Mountain Trout House is located in downtown Gatlinburg, on the Parkway next to Best Western. Drop in for an authentic Smoky Mountain meal.